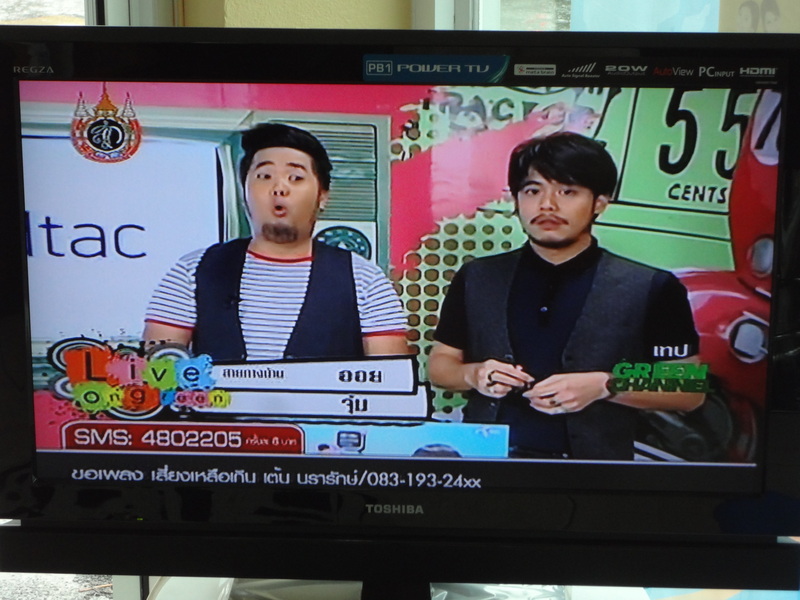 Thai TV is horrible. It’s meant for children or idiots, made as cheaply as possible, and is only one step above talk radio. Most shows feature two or three cute kids in their late teens or early twenties. They improvise all their lines, as nobody has bothered to write a script, and even if someone had, they surely wouldn’t have taken the time to memorize their lines or rehearse. There are two types of shows, the one where a man in his forties reads the newspaper, and a woman in her twenties lends him moral support by saying “Ka (right! )” over and over as he comments on the news. Rarely does she venture an opinion, nor does she ever begin a story. The other type of show is to have young people talk about just anything at all. Meanwhile the corners of the screen are covered with promotional images, the way we do with Home Shopping channels in the States. This is to send a strong message that the producers of the show realize there is nothing of value in the images they have chosen to present, but maybe you could find some value around the edges, a phone number to call, or a cute picture to focus on. There are, of course, what the Latins call telenovelas, the type of show that only recently has disappeared from our sophisticated screens in the States. Soap operas here feature the problems of terminally cute teenagers whose only concession to acting is to pout. Neither the boy nor the girl ever smile, or say much, they just pout. All the emoting is done by scheming Mothers-in-Law, concerned friends, doting parents. Cute is the operative word here. And Thai teenagers are nothing if not cute. In fact, you never see anyone who’s not cute in public. People over the age of fifty seem invisible. I sometimes venture to the local shopping mall in order to see a movie. Most imported movies are the dullest, least inspired, most CGI-filled action pictures that America can produce. Most Thai movies are comedies, involving a fat guy with glasses, a cute boy and girl, and their wacky relatives. The sound track is full of slide whistles and boings. I have never seen anyone even near my age at a movie in Thailand. Rarely have I seen one within twenty years of my age out and about. They’re all at home, taking care of their grandchildren. I suppose all cultures grow through the same sorts of stages, as rising incomes offer new opportunities to the masses. Thirty years ago, most Thais were living an existence not much different than what their parents endured/enjoyed. They worked in the fields, wearing those conical straw hats. Now they wipe their faces with expensive lightening creams and troll Facebook.